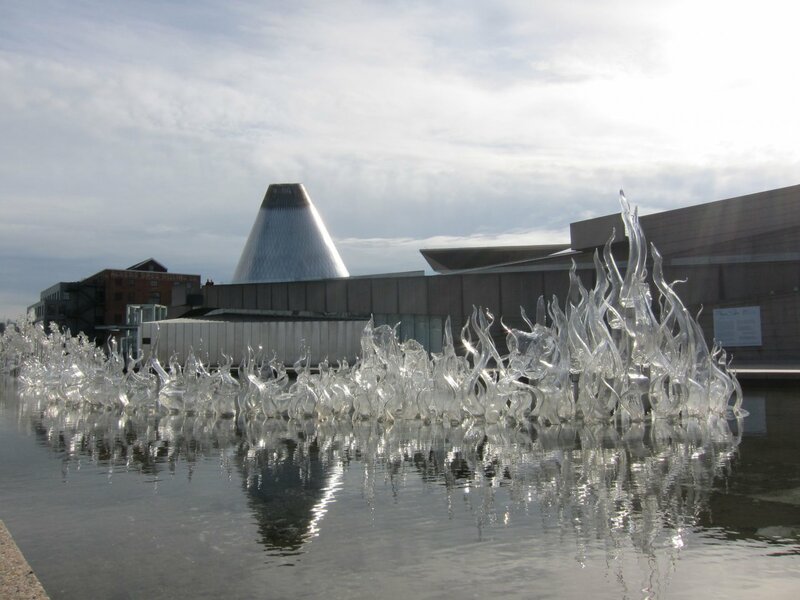 The Glass Museum is located on the Tacoma waterfront. The (abandoned) western terminus of the transcontinental railroad. Murray Morgan (11th Street) Bridge, preserved by the city. A handful of fishing vessels use the Foss as their homeport. Even the sidewalk grating is designed with fish in mind. Walking tour of the waterfront, a work in progress. The Thea Foss Waterway in Tacoma won an Outstanding Civil Engineering Achievement Award in 2005 from the American Society of Civil Engineers. The project included cleaning up pollution associated with Superfund sites, improving habitat, revitalizing brownfields, planning mixed-use development, enhancing public access and public space, all with the intent of reconnecting downtown to the waterfront. A five-track railroad corridor, elevated highway, and vacant properties currently separate downtown Tacoma from the water. When completed, the esplanade will stretch along the entire one and one-half miles of the western side of the Thea Foss Waterway and will reconnect the downtown business district and the Union Station Historical District to the waterfront.